After almost 20 years in senior executive roles at Cricket Australia and the Essendon Football Club, McKenna will take up his position on Monday 28th November. McKenna has been the Executive General Manager, Operations at Cricket Australia since 2012 and has played a key role in the stewardship of all Cricket Australia’s marketing and commercial programs over the past 11 years. In this role, he was the architect of the hugely successful Big Bash League – seen as a benchmark for sports, media and entertainment in Australia. Prior to his roles at Cricket Australia, McKenna was General Manager Commercial Operations at Essendon Football Club for seven years from 1998. During a period of significant transformation for Essendon and for AFL, McKenna led the Essendon club’s move to Etihad Stadium. I’ve been very privileged to have worked at CA during a period of remarkable change in the game and have enjoyed the challenge of increasing the appeal of cricket. The Big Bash League was clearly a highlight but I take great satisfaction from some amazing achievements right across the game. I am very excited about the opportunity ahead, helping to deliver one of the world’s great stadiums. Working with the WA Government, footy clubs, cricket and other sporting codes, the plan is to deliver the best sporting and entertainment experiences for the people of Perth, WA and Australia. The new Perth Stadium is now more than 50% complete and will be one of the most advanced stadiums in the world when it opens for business in 2018. With a seating capacity of 60,000, it will be capable of hosting AFL, cricket, football, rugby union, rugby league and entertainment events. The Western Australian Government has appointed leading venue managers VenuesLive to manage the Stadium. We are delighted that Mike McKenna will lead the team at the magnificent Perth Stadium. Mike has already achieved a significant amount in Australian sport and will bring a wealth of venue, commercial, marketing and events experience to Perth Stadium. I’m sure the people of Western Australia will be excited that Mike McKenna, a proven and focused leader, is heading up the Perth Stadium team. We look forward to working with Mike on the future of Perth Stadium and sport in Western Australia. The CEO role at the Perth Stadium is a pivotal appointment and VenuesWest is excited that VenuesLive has been able to recruit someone with Mike’s skills and experience into the role. Mike has many years of experience in senior management roles in both cricket and football and this background will be very helpful in delivering for these anchor tenants. Mike’s experiences with stadiums globally and nationally give him a broad reference that will support him to lead the Perth Stadium team to deliver world-class experiences for fans and hirers alike. Local media reports suggest that one of McKenna’s first challenges will be finalising negotiations for their Stadium tenancy with the West Coast Eagles and Fremantle Dockers. PerthNow has reported that the Eagles are threatening to boycott the new Perth Stadium until a suitable deal can be reached. 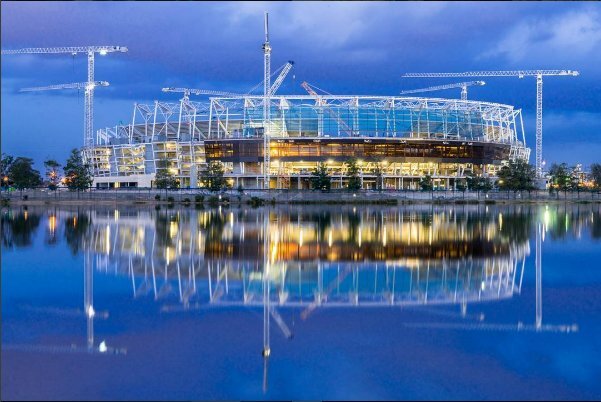 Images: Mike McKenna (main image, top) and a recent photograph showing construction progress at the new Perth Stadium (above, courtesy of COX Architecture). The WESTADIUM consortium architectural team consists of HASSELL, COX Architecture and HKS Sports + Entertainment Group. COX Architecture’s Director for Sport, Alastair Richardson, will be speaking at Stadia & Arena Asia Pacific in Japan next week, the Practice also has a stand in the Exhibition Hall, #B09. If you haven’t already secured your place, then make sure to do so now at: www.SAEvents.uk.com and join the 1,500+ industry professionals that are expected to be in attendance.